From time to time, we have older dogs available either for sale or free to the right home. Meet Lucy, she is a 5 year old female. 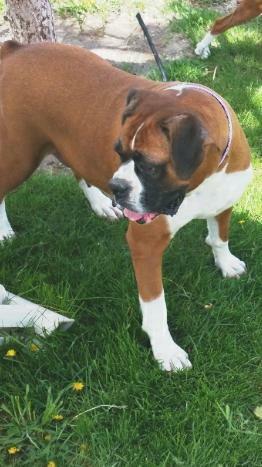 Lucy is now retired from the Kloud 9 Boxers breeding program and deserves an awesome, forever home. Lucy is truly as sweet as they come! She is very people oriented. She loves people of all ages and is excellent with children. Lucys favorite thing to do is cuddle. Lucy does well with male dogs but not other females. Please contact us for additional information and to schedule a visit to meet our beautiful girl.